Many brands, from shampoos to hamburgers are presented in their TV ads by a male voice, even if the people in the ad are women. Why? According to research published in Psychological Science it may be because our brains are wired to prefer female voices to male ones, but when it comes to credibility, research tells a different story. On average both males and females trust male voices more. In one study conducted at Stanford two versions of the same video of a woman were presented to subjects: one had the low frequencies of the woman’s voice increased and the high frequencies reduced, the other vice versa. Consistently subjects perceived the deep voice to be smarter, more authoritative and more trustworthy. This might explain why a woman can present an idea and go unnoticed, while a man later in the meeting presents the same idea and gets praise and glory – a story told by an endless parade of frustrated women in business or politics. This is not the only way we subconsciously judge men and women differently – and no doubt unfair. Other studies have shown that people accept and even reward men who get angry but view women who lose their temper as less competent. Victoria Brescoll and Eric Uhlmann at Northwestern University who have made studies on this say: "An angry woman loses status, no matter what her position,'. Both men and women were shown videos of actors portraying people applying for a job, some being angry and some not, and to rate applicants on how much responsibility they should be given, their perceived competence, whether they should be hired, and how much they should get paid. Both men and women reached the same conclusions: Angry men deserved more status, a higher salary, and were expected to be better at the job than angry women. Angry men were also valued more highly than angry women no matter what level position they were applying for. Not just gender are associated with personality traits; people also ascribe nice qualities to tall people. They are deemed more worthy, dependable and intelligent, according to Anne Case and Christina Paxsons report: “Stature and Status: Height, Ability and Labour Market Outcomes”. Author Malcolm Gladwell once asked around half of the companies on the Fortune 500 list-the largest corporations in the United States- questions about its CEO. He found even if in the U.S. population, 3.9 percent of adult men are 6'2" or taller. Among my CEO sample, 30 percent were 6'2" or taller. Why is this relevant to businesses? Should companies have to stand up for some kind of justice? Not really - but being aware of how consumers react and feel towards people is crucial. Women control 27% of global wealth and in Australia control 31%, according to Boston Consulting Group July 2010. If these women are not attracted to a brand because it doesn´t have the right approach, the brand misses out. When creating ads or hiring staff, use the fact that the market will automatically see and value a man in another way than they see a woman, which can affect the way the message is getting through – to consumers of both genders. Use the fact that we are judgmental and unfair to your advantage. Marketing campaigns are often created in stress. An agency gets a brief and has a week to come up with a Big Idea, and this leads to many agencies limiting their research to a brainstorm with the often young people at the office. When the insight is built on such poor input, the risk is massive that the Big Idea is based on automatic beliefs of men and women, of caricatures rather than real people. 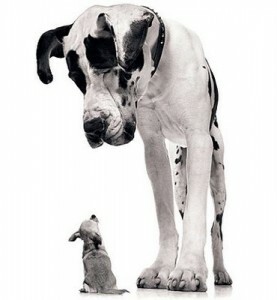 Make sure you are not listening to sales people and leaders simply because they are tall and speak with a deep voice. Sometimes the most clever ideas are born within a short person, and sometimes your subconscious mind will be tricked into closing a deal with a company simply because of the physics of the CEO.